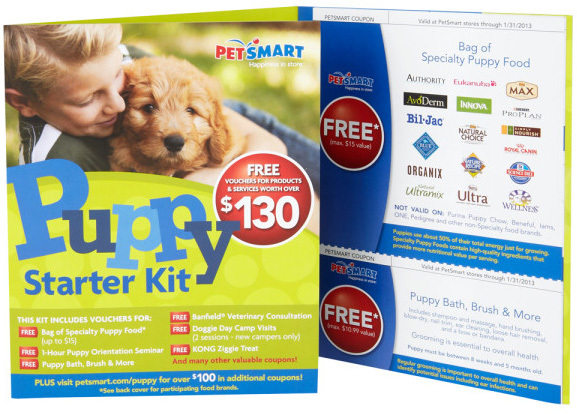 Get Ready for Puppy with the PetSmart New Puppy Starter Kit #Giveaway! Filled with over $130 in Coupons and Savings! Owning a dog is a big responsibility and there are a lot of items you’ll need in your household for your new puppy! I’ll never forget when we brought our little Wheelz home. He was only a few months old and he became our first little baby, just look at how cute! Before we brought him home we had to gather all the necessities that a new puppy requires, which can be expensive! So to help you get ready for your new puppy, PetSmart put together the PetSmart New Puppy Starter Kit. The New Puppy Starter Kit comes with all sorts of coupons so you can stock up on all the necessities including food, grooming items and even a coupon for a Free Kong Toy (which are perfect for a teething puppy!). Not only does it have coupons for the necessities but also included is a coupon for a 1 Hour Puppy Orientation Training Seminar to help you get started on training your new fur baby, a free Vet Consultation at Banfield and even 2 Free days at Doggie Day Camp. All together the coupons are worth over $130! I love that they’ve included a coupon for a free bag of dog food that allows you to choose from a variety of brands, our pups favorite Blue is even on the list. Oh, and for those inevitable accidents there is a coupon for a free Bissel Stain & Odor product, believe me you’ll need it! 🙂 Having a new puppy is alot of work but so worth it and I love that PetSmart has put together these coupons to help new puppy owners save money and get ready for thier new family member. The PetSmart Puppy Starter Kit is available at PetSmart stores and online at www.PetSmart.com for only $19.99! PetSmart is giving one lucky winner a PetSmart New Puppy Starter Kit! You’ll be able to get all the stuff you need for that new puppy! To enter fill out the Rafflecopter form below. Ends 5/2 at 11:59PM EST. Disclosure of Material Connection: This is not a paid post and I did not receive product for this post. All thoughts and opinions are my own and this post has not been edited by anyone other than me. I am disclosing this in accordance with the Federal Trade Commission’s 16 CFR, Part 255: “Guides Concerning the Use of Endorsements and Testimonials in Advertising.” The opinions expressed in this post are entirely my own. Your experience with the product may differ from mine. The sponsor is responsible for prize fulfillment and will be shipping the winner(s) their prize(s). For more information read my disclosure policy. I would love to win this for my mother in law who just got a brand new 2 month old Yorkshire puppy a few days ago, this would be perfect for her! Thanks so much for hosting this great giveaway! I’d love to win this for my dog Sunny! What an awesome package, I would love to win this and keep it for myself. I have a 9 month old APBT mix named Pan who has severe allergies, he is my baby and would definitely benefit from a lot of these coupons. You are so right when you say having a puppy can be expensive. This sounds like a really great package, which would come in real handy. My family is currently trying to deceide which kind of puppy to get. Id love to win this! Just got a black lab puppy! I’d like to win this for our household because we’d like to adopt a puppy soon. I would like this for our new puppy! He is 14 weeks old and his name is Trevi (like the fountain) and he is adorbale, but naughty. My mom is getting a new puppy here soon. I would like it for my sister’s new puppy. This is a really good kit. Some of the stuff is sorta free, but it’s more like $15 off and so on. But i recommend it. I am not getting any coupons on line and I have already bought this.